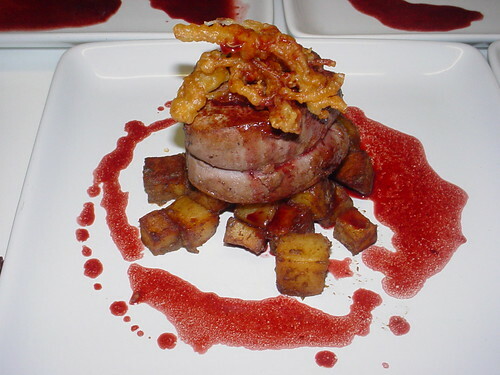 Filet Mignon served with Syrah wine sauce, Porcini flavored potato cubes and Enoki mushroom tempura. 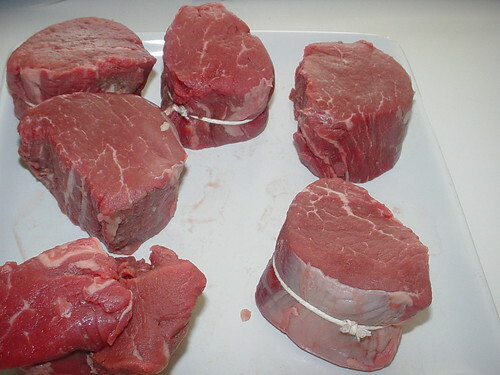 I’m usually never a fan of beef filets. They are expensive, relatively bland and way too lean. Did I say they are expensive. Yes, for what they have to offer, the hefty price tag is usually not worth it. I much rather buy a rib eye or a NY Strip instead. So, why did I make this recipe. Well, my wife likes them and it was a sort of special occasion with the in-laws. The picture in the book looks pretty amazing too. So, I figured if I’m buying filets, let’s give this one a whirl. It’s probably better to start this a day ahead, not because of anything difficult, but there are several steps and two sauces to make. Since I had none of the ingredients on hand, I had to shop and cook everything the same day. First I made the Syrah sauce. 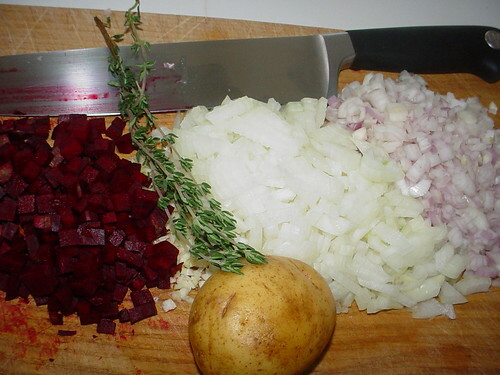 I sautéed the shallots, beets, onions and thyme. Then I tossed in the garlic and potatoes and cooked that for a minute. Next goes in a whole bottle of Syrah along with some reduced chicken stock. This simmers for about an hour and reduces. After straining all the solids out, I added some sugar and seasoning to the sauce and reduced it again to the proper consistency. The Porcini sauce is simpler than that. Unfortunately I could not find fresh or frozen Porcini mushrooms, so I resorted to a trick I use often when I need Porcini flavor. I used about an ounce dried Porcini and a few fresh Creminis. This works great and you end up with a pungent Porcini flavor in the dish. 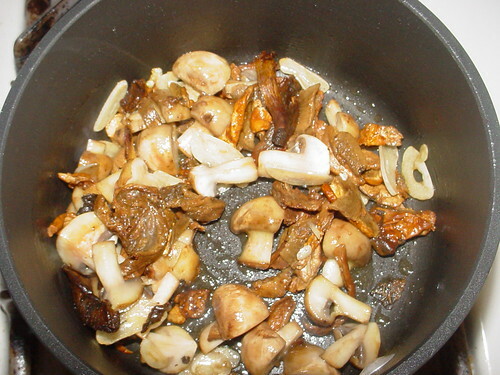 Here, the mushrooms are sautéed first then simmered in some reduced chicken stock for a few minutes. The last step is to puree the sauce and season it. The end result is a thick, but not pasty, porcini sauce. Next I cooked the potatoes the first time. I cubed them and pan fried them in a healthy amount of olive oil and butter with a few unpeeled garlic cloves. These cook like that until golden on all sides. Once that was done I left them to drain in a colander on top of a bowl until service. 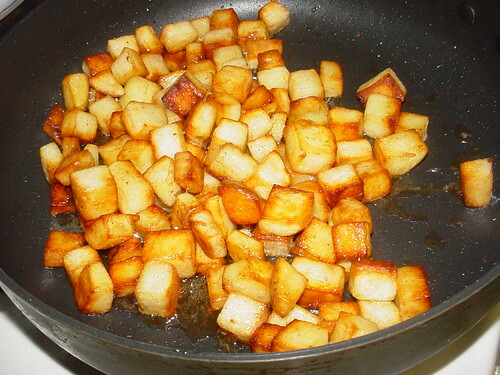 When the steaks were roasting, the potatoes are crisped in the pan with more fat, drained and then tossed with the Porcini sauce. I did not use all the sauce here. It just looked like too much and I did not want the potatoes to swim in it. I used it more like a dressing and had about 1/3 of it left in the pot. 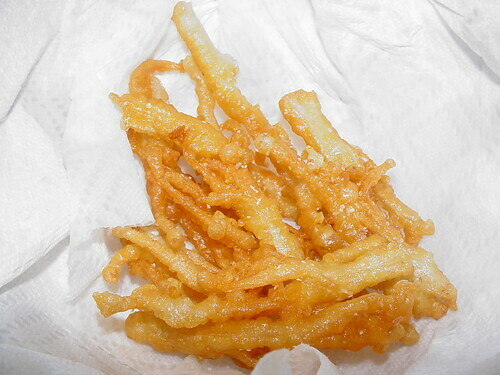 Right before cooking the steaks and actually throughout, I made the Enoki tempura. I am not sure why I never made tempura before. I guess I thought it would be difficult or something. If there is one thing I learned from this dish, it’s that ‘Tempura is Easy’. Very easy and so damn delicious. 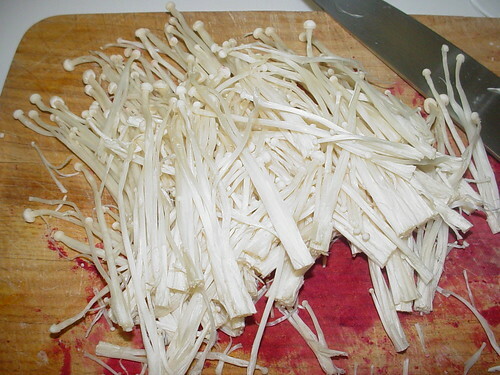 I had roughly twice the amount of Enoki mushrooms required by the recipe because they only come in this one size package at Whole Foods. The tempura was so delicious we almost ate it all and had none to garnish the plates with! 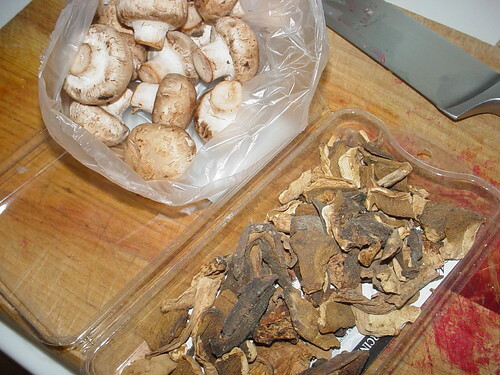 It was nice and crispy and the small thin mushrooms retained their juiciness and flavor. For the batter I mixed carbonated water with baking soda, flour and salt. That’s it. I cut off the root end of the mushrooms and separated them into small clusters. 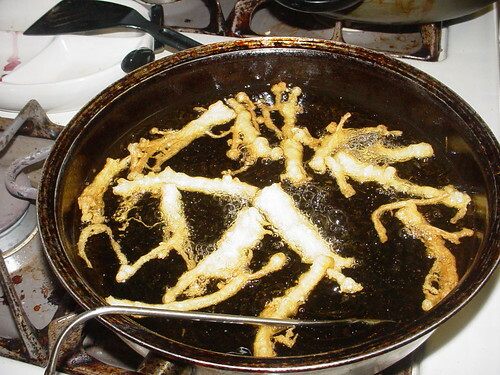 These were tossed in the batter then deep fried in 350 degree oil for a minute or so. 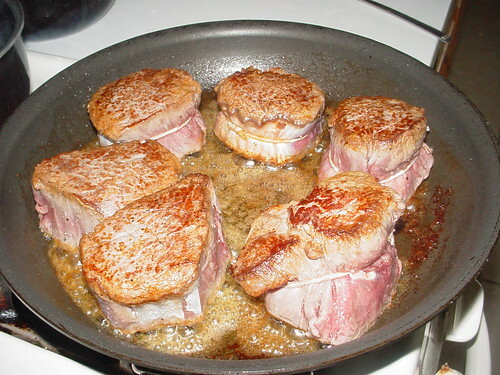 The last batch came out of the hot oil just as the steaks were coming out of the oven ready to be plated. So, 15 minutes or so before plating, I browned the steaks in olive oil and butter, then put them in the oven till they were medium rare. To plate I put a pile of the Porcini potatoes and topped that with a filet. Next I swirled some butter in the Syrah sauce and drizzled some on top of the meat and some around it. 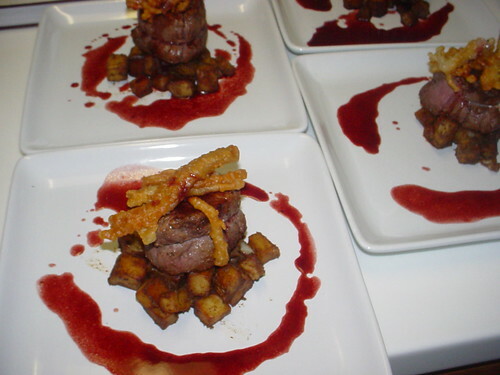 Last but not least I topped each steak with a few Enoki tempura pieces. It was good, very good. I am not saying I’ll be cooking a piece of beef tenderloin once a week, but this cut of meat, when treated right and cooked rare can be a thing of beauty. This is one of the best, not actually the best Filet Mignon I’ve had. Ok, well, I almost never ever order it in a restaurant, but still this was fantastic. The earthy pungent potatoes, with a piece of the buttery meat dabbed in the intense sauce then followed up by a piece or two of the tempura is the way to go here. The lovely combination of taste and texture is remarkable.